Many Lego-related blogs are written about modern sets. This especially applies to investment-related blogs. In a series of articles I try to generate enthusiasm for some of the more interesting vintage Lego sets. We enjoyed building them as kids, whereas probably more often we jealously admired them in our best friend's collection or in the Lego catalogue we devotedly picked up in the toy store. This is primarily a blog of nostalgia. However, investing in vintage Lego can be an interesting and fun pastime. The quest to find rarer sets, to restore incomplete sets and to assess your recently purchased lot of bricks can be exciting, relaxing and rewarding. In this series of blogs I will describe sets, show pictures, provide general and set-specific information for collectors and investors, and finalize each blog with some fun stuff. After reading a couple of these blogs you'll hopefully get a certain confidence in this matter. Let's start with set 1592, the Town Square. Those who are not interested in this set's history and contents are invited to fast forward to the "tips for collectors and investors" below. There's a festival in town! It's the end of summer and everyone is out on the streets to celebrate the last days of sunshine. Behind the medieval castle walls there is a party. Here on the town square a procession comes by... a classic car, a flower float, minifigures in historical costumes... come and join the fun! Of course, this set being a promotional item, there's a commercial detail. In this case, the minifigures are invited to have a soup with some smoked sausage. This set was first issued in 1980 in the United Kingdom as a promotion for the British cereal producer Weetabix. Although the link between this set and cereals escapes me (the sign crowning the snack bar says "fish & chips" rather than "breakfast cereals") that doesn't make the set any less desirable. 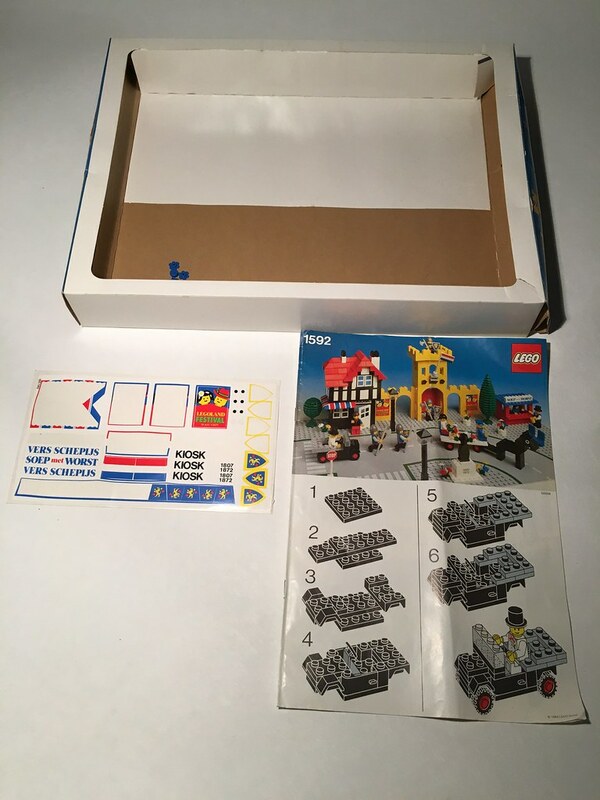 The UK set, produced between 1980 and 1982, features stickers "books", "ice cream", "Legoland carnival" and the UK flag. After its initial sale in the UK, from 1981 the set was sold in Australia, Canada, Sweden, Germany1 as well as Japan2. Clicking this link will show you a German advert from around 1981. The advertiser, Fachgeschäft Spielzeugring (German toy retailer group), tells us this is a 'large city centre-themed gift set with a lot of content and endless playability'. Then in 1983 a new set 1592 was issued, being a promotional item for the Dutch company Unilever. Already then one of the largest Netherlands-based companies, Unilever has produced a wide array of foods, cleaning articles and personal care products. One of the many brands held by Unilever is Unox, best known for its soup and its (delicious) typically Dutch smoked sausages. To this day movable carts just like the one seen in set 1592 are used to sell these sausages and sometimes soup. In winter soup with smoked sausage is just as commonly seen here as fish and chips are (or should I say, were) in the UK. So The Lego Group and Unilever both did the math, resulting into the advertisement seen here3 (scroll down a bit). "Send me Lego box no. 1592 "Village with procession" for the special Unox-price4 of €18,13 inclusive of shipment. I enclose payment plus 3 promo wrappers. N.b. of course you can order more than one Procession set. For every specimen, use a new order form plus 3 extra promo wrappers (maximum: 3 per family). U can also get the box without promo wrappers, in which case we will need to charge €2,97 shipment- and administrative costs. This promotion runs until December 1983." 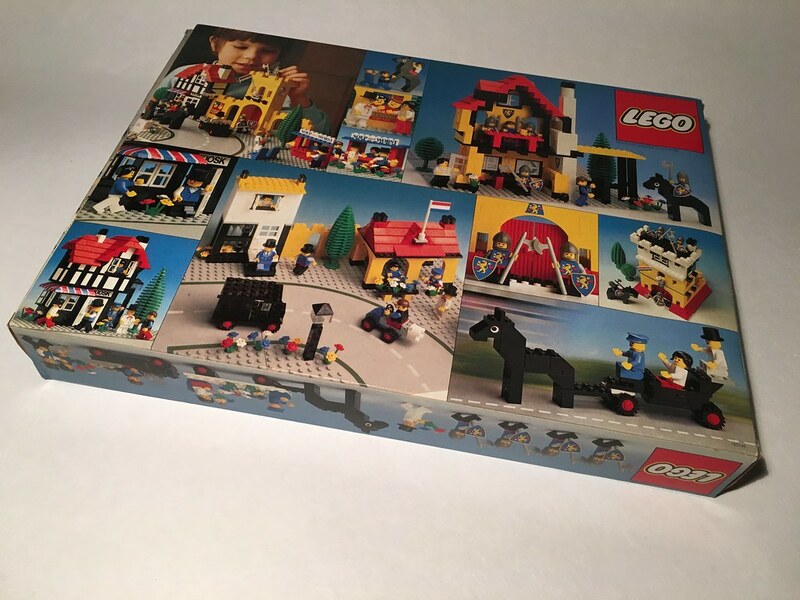 "Unique Lego box costing you only €18,13 plus 3 Unox promo wrappers (shop advice price €31,54). "Village with procession" true measurements 39x29cm. Enjoy that tasteful Unox soup while saving for that unique Lego procession box"
We are fortunate to know that the shop advice price was €31,54 even though this set was never available in any shop. 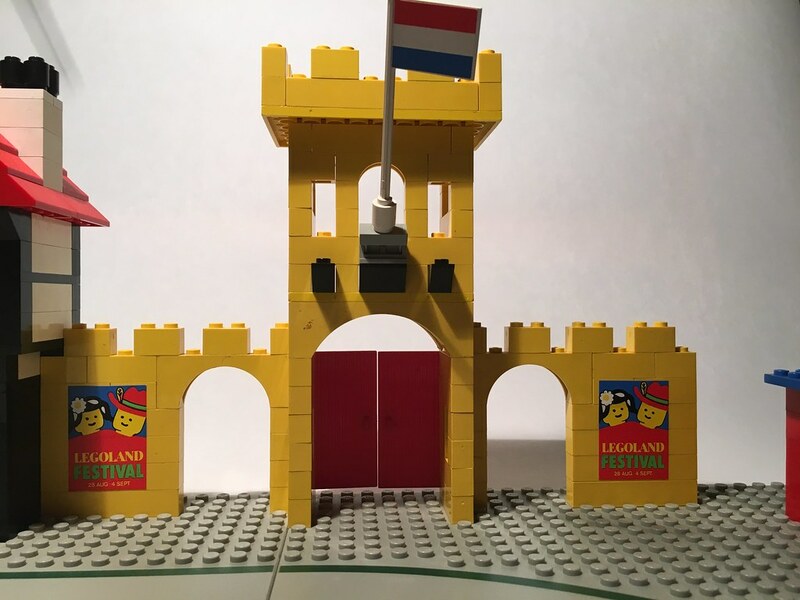 "A Dutch acquaintance was a LEGO fan as a child... along with his 2 brothers... And their parents sent in 3 sets of UNOX Soup labels and money to get 3 of the Dutch 1592 sets. Well guess what arrived?? 2 Dutch and 1 British version of the 1592 sets!!" All of this makes Dutch 1592 the rarer of the two variants and also the most sought-after. The set comprises of 471 or 4916 parts, 10 minifigures 1 statue and 1 steroids-fed horse. 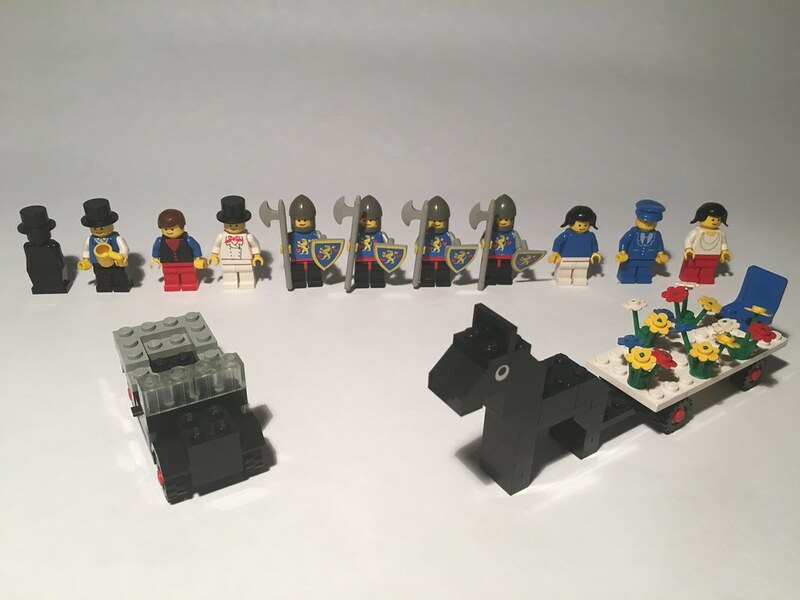 Let's first look at the minifigures, horse and vehicles. Back row, left to right: a statue, costumed man (with cup for soup! ), book seller, convertible car driver, 4 knights, soup and sausage seller (previous job: fish & chips seller), flower float driver, flower queen. Front row: convertible classic car, horse, flower float. There are stickers for the knight shields, knight torsos and horse eyes. I'm not sure the eyes are all that realistic and if aligned carefully they will make your horse resemble cookie monster quite realistically. One year later, in 1984, The Lego Group would issue a horse part (Bricklink: #4493c01pb02) with slightly less disturbing eyes. The convertible car is a very neat little build, cleverly using a pile of 2x2 wheel plate + 2x8 plate + wheel fender + 2x3 plate + 2x2 plate to make a black grille. A child could choose to pose the knights on and around the castle, or to let them walk in the parade. Probably, behind the castle walls other festival activities were going on. According to the poster, the festival took place from the 28th of August until the 4th of September. The Dutch flag consists of a white part + two stickers. The flag in the UK set had UK stickers, as mentioned. The second building is the book shop. The UK set has a sticker "books" for the kiosk one. The building is just lovely! The half-timbered structure is represented convincingly and the use of then-new windows and -door are very charming. The roof structure is rather complex and is fun to build. The building's only flaw is the use of the striped stickers on the canopy. I'll come back to that later. On the above picture you can also see the cypress tree which is considered a rather rare piece. Not as rare as finding one actual cypress tree within the boundaries of a Dutch city though. As can be seen in the above picture, the book shop even has a modest interior. The rest of the set consists of two lampposts, a statue of a guy, a STOP traffic sign, a blue bench, fruit tree, an avalanche of flowers (some in pots) and of course the soup with smoked sausage stand. The sticker sheet contains alternate stickers "vers schepijs" ('fresh ice cream'). Lastly, the inner box, sticker sheet and instructions. Note that there are spares for most stickers: 5 knight torsos, 3 knight shields, 3 kiosks, 2 statue stickers, 3 snack bar stickers, 3 pairs of terrified horse eyes and 1 festival poster. Most unfortunately, the two weakest and rarest stickers (shop canopy) are not offered as spares. On the picture you can also see the great build of the car. Check out the way the designer designed that grille! While the UK set (1592-1) and the Dutch set (1592-2) are both quite rare, 1592-2 is the less common of the two. The 2008 Lego Collector Guide rates the rarity of 1592-1 as 5/6 stars and 1592-2 as 6/6 stars. 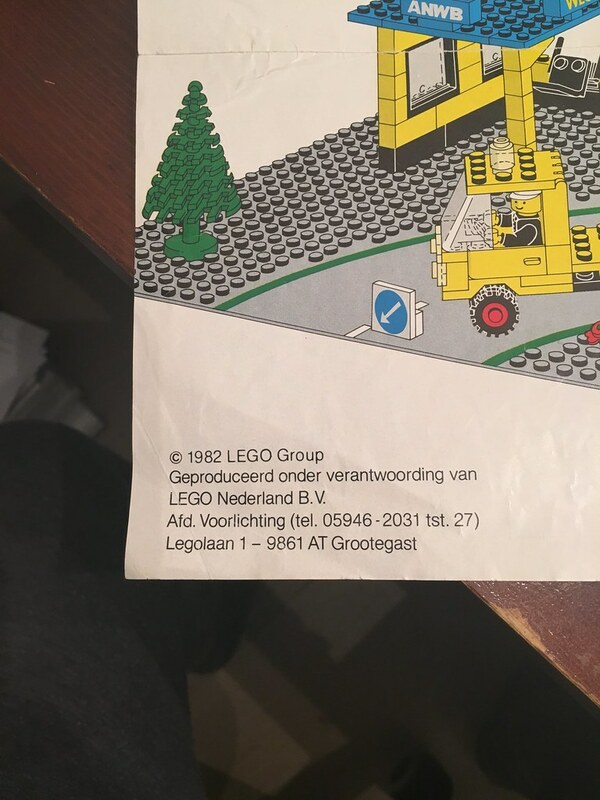 According to the amazing Unofficial Lego Sets / Parts Collectors Guide7 the value of an excellent condition set (minor wear, box and contents are in well cared for condition) is 200 to 250 euros. In case you're planning to gather this set from several sources, try to start with a boxed version with incomplete stickers. Check the state of both inner- and outer box. If ordering online, ask for several pictures. After you've found a box(ed incomplete set), make the canopy stickers your next project. These are almost always gone, because they span multiple sloped tiles without much grip and there are no spares on the sticker sheet. To make matters worse, these stickers have a slight overhang. I reckon most canopy stickers were thrown away after building and disassembling the set once. Having found a box and all stickered parts makes life easy. None of the parts are exclusive to this set. Nonetheless, some are difficult to find such as the four black lantern cap parts, only present in two other rare sets; the above-mentioned cypress tree, currently for sale on Bricklink for at least €11,50; the unstickered knight shield, only to be found in two other sets; the two red doors and the black statue head which was only used in 4 other sets. You'll probably have to Bricklink these parts if not present. A full inventory of Lego set 1592 can be found here. 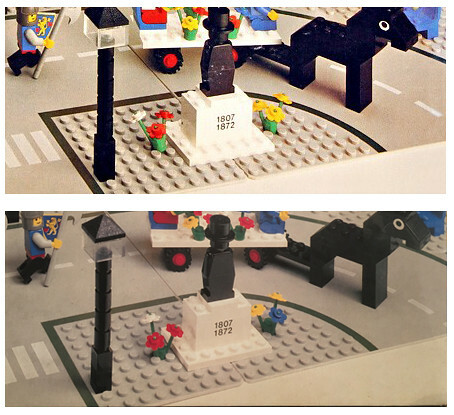 Make sure the white flag part, the STOP sign and the two base plates are intact and unglued, the large black statue head hasn't been replaced by the more common cilinder part, the stickered knight torsos have not been replaced by similar looking torsos and the knight legs have not been replaced by other color combo legs. Check that the bricks (especially white, blue and grey) have not been discolored. If you want to try to restore the original color, read this blog carefully. Ideally the stickers have not applied at all; if so, they should have been applied as neatly as possible. Make sure the festival stickers have not been torn (like the canopy stickers, they span multiple bricks). If a sticker sheet is present, check for authenticity. The backside of an original sticker sheet reads "FasCal REMOVABLE", the sheet number is 195145. Beware that sticker sheets are being reproduced nowadays. 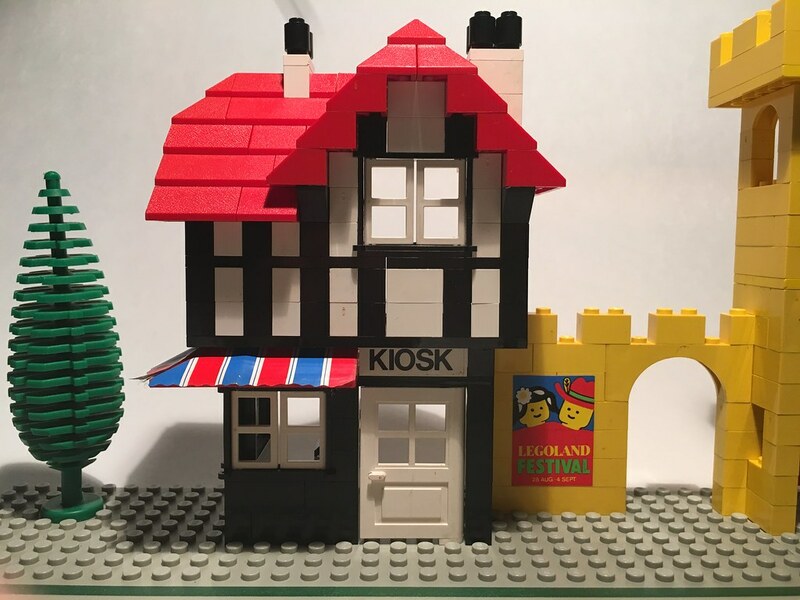 Usually the best place to find rare Lego sets are Brick Classifieds (good deals), Bricklink (varied offer) or Ebay (quick purchases). As 1592-2 was only sold in the Netherlands, it's not easy to find it elsewhere. So you'll have to think out of the box. Introducing... the Dutch virtual market place Marktplaats. There you'll probably find one or more 1592s offered for sale. You'll find Marktplaats to be a bit different from the three above-mentioned platforms. First, bidding is possible but it doesn't bind you. So it really has no validity whatsoever. It's always a good idea to directly contact the seller, telling you that you're a foreign collector (or investor, if you think that's wise) of Lego and that you're interested in their set. Ask the seller if he will ship to where you're living. Then the awkward part: if you don't have a Dutch friend who can pick it up for you, you'll have to trust the seller and pay him or her trusting that they'll send you what you bought. It's a bit tricky but I never had a bad experience in the 10+ years I bought and sold through Marktplaats. Wise thing to do before paying any money: check how many years the seller has been a Marktplaats member, then Google the seller's name co-using the words "fraude" or "vals". Have Google translate the search results and conclude. I always ask for the seller's address, explaining it is for my own protection. Literally everybody gave their address without any objection. In the end you can never be 100% sure but it's better than nothing. Once you've completed the set, clean the parts (good method: by hand, see this thread) and ideally put them away in a dark, air-conditioned closet so the discoloring process of both bricks and box will be minimal. Or display it... after all it's a grand piece! On with the fun stuff. First, a picture of two sets of Dutch instructions. Can you see what's wrong with the bottom one? Here's the answer. Unilever, holding company of cleaning solution brands, was clearly thought to sell sausages as well was soap during the Legoland festival. This funny error is continued on the two last pages of the instructions. I'm not sure when exactly the instructions were corrected. I have not heard of incorrect stickers or boxes. If anyone has those or knows they exist, please let me know. While the instructions of 1592-2 correctly mention copyright 1983, the box incorrectly says 1980 (clearly copying the 1592-1 box). This set is considered by some as one of the best The Lego Group has ever produced (see these and these reviews. It still inspires people... check out this awesome remake! Who's the statued guy? Living 1807-1872 it could be Italian cellist, educator and composer Carlo Curti, or British lawyer, diplomat and writer Henry Charles Sirr. Frankly and unfortunately I haven't been able to find any plausible candidate for this statue to imply an easter egg. If anyone finds out anything interesting on the matter of the statue, do let me know! 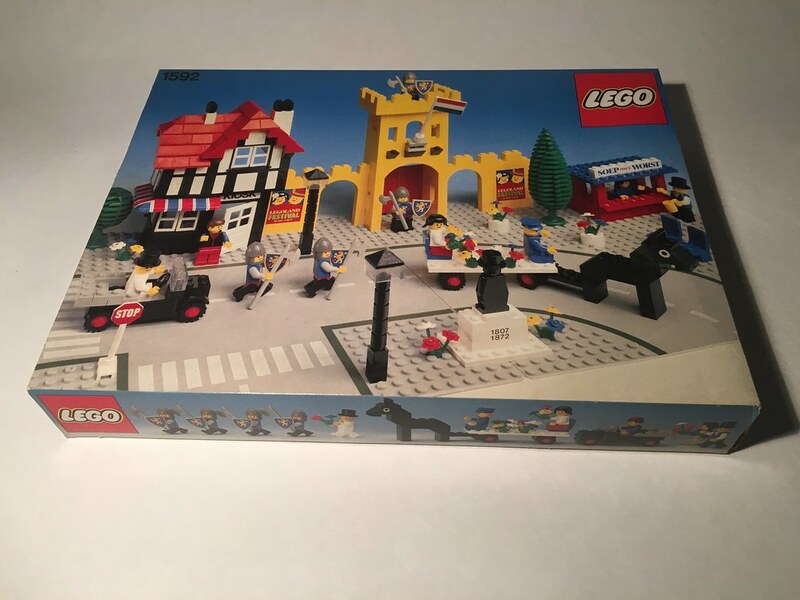 2 years before the UK release of the Town Square, another interesting set was released. In 1589 (Main Street) we can spot... a piece of yellow castle wall, just as tall and with the same battlements as seen in 1592. It gives reason to believe both walls belong to the same castle. Nice detail for those kids who really paid attention. The castle bits of these sets also remind of castle set 375. Last, not least! I know all of you have been desperately waiting for the answer to the question "so what's the difference between 1592-1's and 1592-2's boxes?" Well, TLG definitely did its best to make both boxes look as similar as possible, probably in an attempt to get away with delivering some stock 1592-1 boxes to Dutch customers... comparing both boxes very closely, the differences are barely noticeable (except for the stickers, of course). The car and flower float have moved a bit, the knights' heads are positioned slightly differently, the shadowing, the background color... all a bit different. But the trees, lampposts, minifigure gestures and door positions are just the same. Perhaps as an insider joke, there's one difference though... the flowers! Some of the several flowers differ in color. And behold... one bed of flowers was even added to the 1592-2 box picture! In all you really have to look carefully... (top: 1592-1, bottom: 1592-2 box fragments). 1 See this Bricksetforum post written by Lego historian Gary Istok. 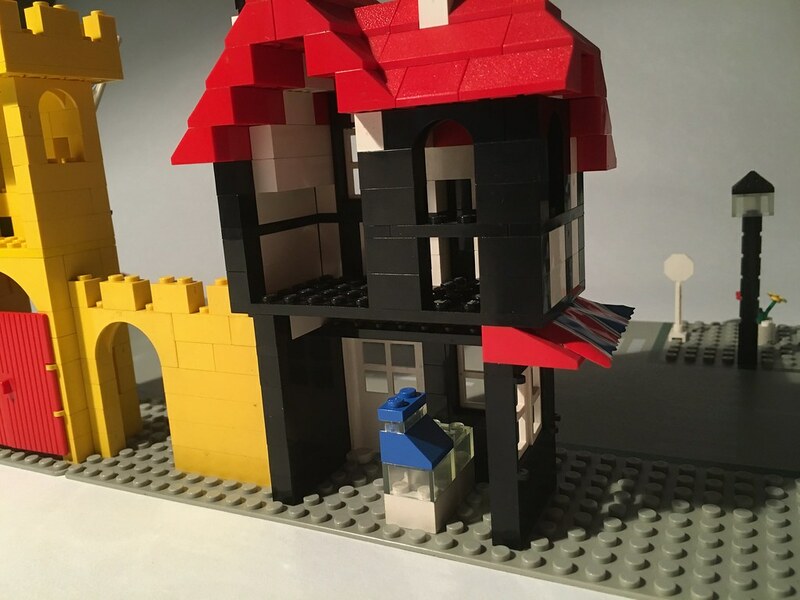 2 See this post on the Eurobricks forum written by Lego historian Gary Istok. 3 See this post on the Eurobricks forum. 4 The price in Dutch guilders was fl.39,95. 5 See this post on the Eurobricks forum. 6 The 2008 Lego Collector Guide p166. 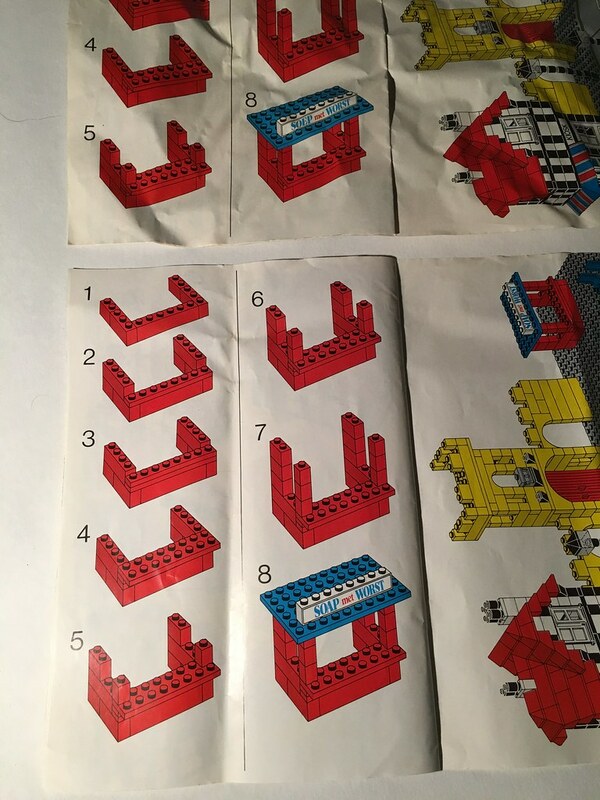 7 Unofficial Lego Sets / Parts Collectors Guide, Gary Istok, price list. To see prices for very good, MIB- and MISB-conditions I strongly advise anyone to buy Mr Istok's magnum opus. It simply is a treasure chest loaded with facts, figures and pictures of every imaginable Lego-subject from the 30s up to and until the 90s. See here for a bunch of teasers and here to purchase it. Set 1592-1 is discussed in chapter 17 page 18, set 1592-2 in chapter 17 page 28. Edited January 31, 2016 by Roy vd M.
I really enjoyed this article. I have to say I don't pay attention to the old sets, but when I do I focus on them when reading about them in an article like this, it brings me back to shopping in a store and remember Ed looking at many of these sets. I miss the old boxes that would let you flip the lid and look at the parts inside. Great photos, history and references in here. Great Job!!! Great blog Roy, thanks! I love the old sets too. When I first got into investing I spent the first year buying a lot of mixed vintage lots and piecing together old sets, buying the instructions etc. It was great to rediscover so many old 70s and 80s sets that I missed out on as a kid. It's very satisfying piecing together an old set and bringing it back to life. The best deals I found was a mixed lot containing 928 Galaxy Explorer along with six other classic space sets, and about a dozen small classic town sets all complete and in lovely condition, which I tripled my money on. Also a bundle of about 10 MIB train sets from the 70s that I also tripled my money on by selling them separately. A lot more fun than buying new sealed sets and hording them, as you actually get to build all the sets. A lot more fun than buying new sealed sets and hording them, as you actually get to build all the sets. True! That's something to remember and quote for the next blog in this series. Great article. Thank you for the obvious amount of time and work you put into it. Lots of great info. It's great to see someone delving into the classic sets. Can't wait to read the next one. I enjoyed that. Food for thought also. Thanks! Fantastic write-up! I've never heard of this set, but absolutely love it. As I mentioned elsewhere, this is the kind of set that I'd love to see refreshed into a brand new set. I'd love to see a modern take on this, with modern colors and parts. This set falls into "civilian sets" which, I feel, we don't get enough of within the City line. FANTASTIC! Loved the post. I love Lego history like this, and I hope you'll write more! Seeing an old box like that in near mint condition is always fascinating to me. Yellow Castle and Main Street were both some of my favorite sets I had as a child. You can see their influences (or vice versa) in this set. It is beautiful and sad it was never released in the US. Thanks you for the write up. What a good article and fun to read! To be honest, never knew this set existed, thanks! Great Article. My wife and I are both big into set restoration. and i am constantly buying bulk bins, and spending many hours sorting to find the parts i need to complete sets on my large ever growing spread sheet. i have lucked out with lots of good sets that resale quite nice. Great write up! Love to see more info on vintage sets. Keep them coming! I really enjoyed this article. I have to say I don't pay attention to the old sets, but when I do I focus on them when reading about them in an article like this, it brings me back to shopping in a store and remember Ed looking at many of these sets. I miss the old boxes that would let you flip the lid and look at the parts inside. Part of the fun in writing this was similar to what I hope is part of the fun reading: nostalgia Agree on the boxes, they were more fun and teased the imagination of kids. If you'll remember though, many boxes were plastic-sealed. The subject of this blog, set 1592, is an example of that. It was great to rediscover so many old 70s and 80s sets that I missed out on as a kid. It's very satisfying piecing together an old set and bringing it back to life. (...)which I tripled my money on. (...) A lot more fun than buying new sealed sets and hording them, as you actually get to build all the sets. Indeed it's a lot of fun to finally collect and build the sets you'd always wanted to have. This set 1590 was owned by a cousin of mine and I have very fond memories of playing with it. Was always jealous... and now I own a specimen myself. Very happy about that. Also, as you say, it's very satisfying to finally receive that last brick or piece by Bricklink-mail and complete the set. To me that feels like I've done something important bringing back a set's former glory... most people will roll their eyes at this I know And you definitely have a point where you say that it's simply fun to get to build the set. As will become clear in a future blog in this series, most sets from e.g. the '80s were designed very well and very cleverly. It's utter joy building them once more / finally. @Tripling money: that's something that doesn't happen as often with these vintage sets I think; I can imagine you felt good afterwards. Having fun (more so than 'collecting' modern sets') and getting paid for it! Thanks, it has been my pleasure! Working on it, could take a while though. Good to read that it manages to inspire. Interesting to read that you had the Dutch version as a non-collector, as it was only sold in the Netherlands. Do you know how your set managed to find its way into the US? Thanks Alpinemaps. It's an adorable set, for sure. Did you take a look at the modern take on the set by a MOC'er? Didn't want to use pictures because of possible copyright issues (and the blog was long enough as it was) so it was easy to overlook that link; take a look here... curious to know what you think of it. Seeing an old box like that in near mint condition is always fascinating to me. 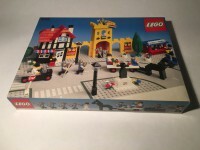 On the other hand it's sad that Main Street (6390) was never released here in Europe. That set is also very desirable and probably just as wonderful as 1592. I think even the Legend remake (10041) was only released in the US but I'm not quite sure of that. Ah TLG always has and always will find ways for us collectors and fans to long for certain sets. You're very welcome. I think many people don't know this set existed as it wasn't featured in any catalogue. It's a lot of fun but it also takes a lot of time and energy. I like to see it more as a hobby. It's always good if you can make a profit to go along. Well I got 7735 and I was very happy with it Still have it, even boxed I think. But wow that's one mighty collection of trains you got there... I used to dream of those first two! This is one of the best Lego article I ever read.